Syrian President urges bodies tasked with providing relief to increase cooperation with international and local organizations. Syrian President Bashar Al-Assad on Saturday urged government bodies tasked with providing relief in war-torn Syria to increase "cooperation" with international and local organizations, state television reported, according to AFP. His statement came after UN chief Ban Ki-moon issued a report saying that foreign aid was still not reaching millions of needy Syrians despite a Security Council resolution in February calling for greater access. Ban's report last week blamed both sides in the war but singled out the government for particular censure. The United Nations Security Council has admitted that humanitarian aid missions to war-torn Syria have failed - and that the situation is bound to get worse. On Saturday state television broadcast footage showing Assad in a meeting with representatives of Syria's governmental relief committee. "There is a need for greater cooperation between ministries and the bodies involved in humanitarian aid, and to deliver aid without delay, and to work on the ground with all the local and international stakeholders to make aid delivery smoother," he said, according to AFP. 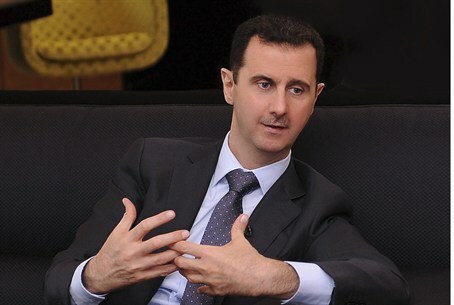 Assad's statement came three days after UN humanitarian chief Valerie Amos said Resolution 2139 was not working. Referring to the wars in Bosnia and Somalia, Amos said the Council would need to pass a number of different resolutions under Chapter VII of the UN Charter to get the required humanitarian access. Chapter VII provides for binding resolutions enforceable through sanctions or the use of military force. Any such resolution would meet with stiff opposition from Russia, a key backer of the Assad regime, and China. International legal experts have also demanded action, and called on the United Nations to deliver aid from Jordan and Turkey via border crossings controlled by rebels. Assad's regime has so far blocked any efforts to allow international aid to be taken into opposition-held areas through the crossings, and his latest statement gave no indication that policy had changed. Instead, he said aid delivery must improve "without compromising national sovereignty," reported AFP. "The state is responsible for covering the needs of all its citizens... not only in the areas where they have fled to (and which are in government control) but also in the areas under siege by the terrorists," he said. Damascus refers to opposition activists and armed rebels as "terrorists," and blames them for the violence engulfing Syria. The UN launched a full-scale aid and evacuation mission in Homs in February, which saw at least 1,300 leave in a mass exodus. UN forces themselves came under fire during the aid mission, and aid workers - as well as reporters at the scene - saw residents suffering from severe starvation. Over 250,000 people are estimated to be in at least 40 blockaded cities across Syria, according to recent estimates - where a national hunger crisis is being used as a political tactic. As the humanitarian situation in Syria worsens, allegations continue of chemical attacks by the Assad regime. Two weeks ago, activists said that over 100 people were killed in a chlorine gas attack in the town of Talmenes in Idlib Province. The Islamic Front, an opposition forces coalition, claimed that victims of the attack were suffering from the effects of inhaling chlorine gas, listed the names of 17 victims, and even released video footage of the aftermath of the attack. The United Nations Security Council has since called for an investigation into the alleged chlorine attack. Several days ago, a scientific analysis conducted for the British Telegraph newspaper found that Assad was indeed chemical weapons against civilians. As part of the analysis, soil samples from the scene of three recent gas attacks in Syria were collected by trained individuals and analyzed by a chemical warfare expert. The results show sizeable and unambiguous traces of chlorine and ammonia present at the site of all three attacks.